I must be one of the luckiest people in the world. Every time I am short of money, I get offers from all over the world from people eager to share their wealth with me, if only I will forward them my contact information and perhaps a small fee to get things rolling. I have had offers from Nigeria, Libya, and even Portugal. Now I have received information about some money that is waiting for me at an international airport. that he won’t be able to know what is in the box. I hope that airport isn’t too far away. I would hate to have to drive too far to get my money. Mitt Romney has attacked Barack Obama for the statements his administration has released after the attack on the US embassy in Cairo. Republican presidential nominee Mitt Romney on Tuesday issued a paper statement sharply critical of President Barack Obama over his handling of violence in the Middle East earlier in the day. Naturally, Obama’s defenders in the Democratic Party and the mainstream media (but I repeat myself) have attacked Romney for playing politics, etc. They have suggested that this was a major mistake on Romney’s part. I don’t agree. The statement by the embassy and Obama’s first response were disgraceful. I read a column by Gail Collins, titled Mitt’s Major Meltdown. I think it is Obama’s middle eastern policies that are suffering from a major meltdown but here are some excerpts. Mitt Romney broke our deal. Perhaps he didn’t know he’d made it, although, really, I thought it was pretty clear. He could do anything he wanted during this campaign as long as he sent out signals that once he got in the White House he was not likely to be truly crazy. We, in return, were going to be able to continue with our normal sleeping patterns through the fall. Feel free to reread this when you’re staring at the ceiling at 4 a.m. This all began on Sept. 11. There were protests in the Middle East, at least some of them involving an anti-Islamic movie, “Innocence of Muslims,” which depicts the Prophet Muhammad as a cowardly, drunken torturer of children and old women. I did not see any puppies being dismembered, but then I only watched the 14-minute trailer. A man identifying himself as Sam Bacile told The Wall Street Journal that he made it in California with $5 million from more than 100 donors. However, nothing Bacile said about himself seemed to hold up in the light of day. And if he did raise $5 million, those donors need to hire a lawyer. The trailer looks as though it was made by a 13-year-old boy with access to a large supply of fake beards. Does that seem all that bad to you, people? It was definitely a film whose only point was to offend people of the Islamic faith. I would also call whoever made it not well-guided. Yes, it does seem bad to me. The statement was essentially shifting the blame for the violence in Egypt and later Libya from the mob that was perpetrating it to the film that allegedly incited the mob. The idea seems to be that no one anywhere may do or say anything that any Moslem might possibly find offensive or that Moslem will react with a murderous rage that the person who offended him will be responsible. That can’t work, unless the whole world is willing to live under Sharia law. It doesn’t matter in the slightest if someone wants to make a film that portrays the false prophet Mohammed in a bad light. They have every right in the world to do so. If someone is offended by this, too bad. That doesn’t give them the right to murder and riot. The only proper statement from an American president would be a unequivocal denunciation of the rioters and a clear statement that we will not censor ourselves or abridge our God-given liberty to appease a group of savages halfway around the world. Giving in to these barbarians, even a little, is not only despicable and cowardly but also unwise. If you give into a bully once, he will expect you to do so again and again and will keep on getting worse. It is long past time we began to stand up against these bullies in the Moslem world. Oh, joy. Tell me again that our kinetic military action to overthrow Gadhaffi was a good idea. Here is an item from CNN that suggests otherwise. TRIPOLI, Libya (CNN) – A potent stash of Russian-made surface-to-air missiles is missing from a huge Tripoli weapons warehouse amid reports of weapons looting across war-torn Libya. They are Grinch SA-24 shoulder-launched missiles, also known as Igla-S missiles, the equivalent of U.S.-made Stinger missiles. A CNN team and Human Rights Watch found dozens of empty crates marked with packing lists and inventory numbers that identified the items as Igla-S surface-to-air missiles. Grinch SA-24s are designed to target front-line aircraft, helicopters, cruise missiles and drones. They can shoot down a plane flying as high as 11,000 feet and can travel 19,000 feet straight out. Fighters aligned with the National Transitional Council and others swiped armaments from the storage facility, witnesses told Human Rights Watch. The warehouse is located near a base of the Khamis Brigade, a special forces unit in Gadhafi’s military, in the southeastern part of the capital. The warehouse contains mortars and artillery rounds, but there are empty crates for those items as well. There are also empty boxes for another surface-to-air missile, the SA-7. He said such missiles can fetch many thousands of dollars on the black market. I guess we know what Libya’s major export over the next few years is going to be, besides oil. I agreed that Gadhaffi was a loathsome dictator who mistreated his people and supported terrorism. Worst of all, no one knew how to spell his name. But, at least he was tamed for the last few years. I simply do not believe that the National Transitional Council is going to be much of an improvement and now we are going to have surface to air missiles floating all around the region. From Yahoo News. This might be good news. TRIPOLI, Libya (AP) — Clashes broke out early Monday near Moammar Gadhafi‘s compound in Tripoli, a day after rebels poured into the Libyan capital in a stunning advance that met little resistance from the regime’s defenders. The startling rebel breakthrough, after a long deadlock in Libya’s 6-month-old civil war, was the culmination of a closely coordinated plan by rebels, NATO and anti-Gadhafi residents inside Tripoli, rebel leaders said. Rebel fighters from the west swept over 20 miles (30 kilometers) in a matter of hours Sunday, taking town after town and overwhelming a major military base as residents poured out to cheer them. At the same time, Tripoli residents secretly armed by rebels rose up. By the early hours of Monday, opposition fighters controlled most of the capital. The seizure of Green Square held profound symbolic value — the plaza was the scene of pro-Gadhafi rallies organized by the regime almost every night, and Gadhafi delivered speeches to his loyalists from the historic Red Fort that overlooks the square. Rebels and Tripoli residents set up checkpoints around the city, though pockets of pro-Gadhafi fighters remained. In one area, AP reporters with the rebels were stopped and told to take a different route because of regime snipers nearby. It would seem the the rebels have already captured Gadhafi’s son and heir and they are on their way to capturing the whole city. 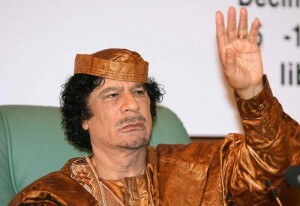 I can’t imagine the Gadhafi regime surviving after this defeat, though I imagine he will go down fighting. I said that this might be good news. The world will surely be a better place without Gadhafi in it but I don’t think anyone really knows very much about the rebels. Will they be able to form a government? Are they Islamist fanatics? Will the new government support terrorists? Nobody knows.